Shopping at your favorite retail store, you find a pair of jeans that fit perfectly, eliminating that stubborn muffin top that seems to have made some permanent roots in your midsection. Looking at the price tag you wince, and then stare at it for a few more minutes, as if the price gets easier to bear the longer you look at it. Maybe using money your spouse doesn’t know about will save a contentious conversation? Or, maybe you will lose more than your integrity in the marriage? Most people go straight to thinking intimate infidelity when a cheating spouse is mentioned, but there is more than one way to drive a wedge in a relationship. Financial infidelity has swept through the homes of happy couples, adding another facet to America’s long list of failed marriages. Every husband and wife know that money is a hot spot in many arguments. It may be that you want to have more spending money for the kids, but your spouse thinks they have enough belongings, or your spouse wants to invest in stocks and you don’t feel that it provides financial security. A wise man once said that the “love of money is the root of all evil” (I Timothy 6:10), and hundreds of years later we are proving those insightful words still ring true. How alarming is this data?! “Hiding” anything from your spouse is problematic unless it’s surprise birthday plans that they will obviously find out about when the time comes. A mindset that supports having a life outside of your marriage is evidence of a society gone astray from traditional values. Moral values that encourages a marriage between a man and a woman, becoming one flesh, have been blurred by the stampeding liberal agenda that looks to abolish a sacred union. Feminism, as the left sees it, is not doing relationships any favors. With a push for independence from the man, and men being demeaned as the financial guarantor of the family, it was only a matter of time before having a separate bank account became the natural culmination of things. Shockingly, “20 percent of all survey respondents feel a partner hiding a secret bank account from them would be worse than physically cheating,” according to the poll. Money- a simple means to an end- was deemed a worse root problem, for millions of people, than having their partner be intimately unfaithful! That shows where couples of today are rating their priorities, but then again, if you don’t value the institution of marriage, then why would you value the proponents that make it effective. The CreditCard.com poll also found that 2 percent of those surveyed would break up with their significant other if they had $5,000 in hidden debts. It is obvious that having a secret financial account means that you do not trust your partner with your money or your choices of how to spend it, and experts agree. Carissa Coulston is a clinical psychologist and author of The Eternity Rose blog. Coulston points out how secrets lead to lies, which results in trust being broken. Many relationships can’t survive this kind of strain. 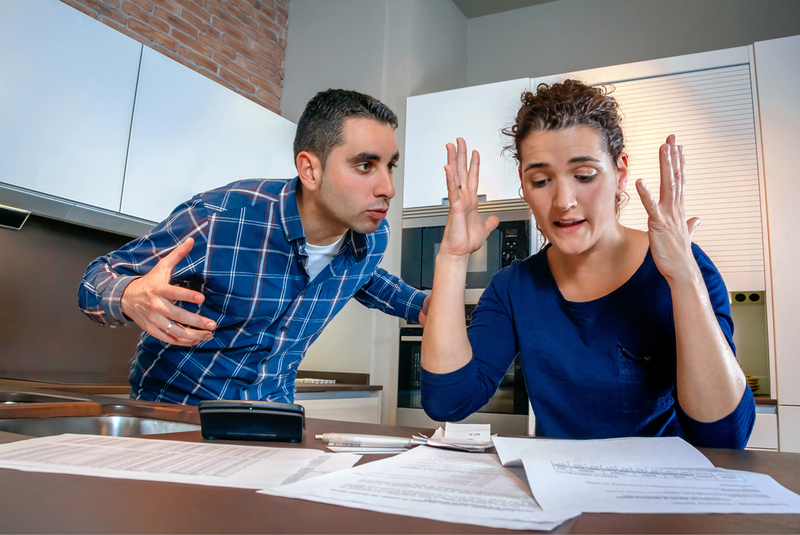 Apparently, millennials (18-37) are the worst offenders, with twenty-eight percent admitting to hiding a financial account from their spouse or live-in significant other. This is almost twice as many people to be sneaky with money than those who are older. Some experts believe this is because millennials are more likely than older married couples to use apps to manage their money, making discretion easily attainable. Coulston, on the other hand, believes that the younger married generation is looking to be able to purchase “whatever and whenever they want”, without a potential conflict from their spouse. Vice President of financial consulting firm VFG Associates, Tiffany Welka, has a different take on why some spouse’s keep hidden accounts. More millennials than not have seen divorce devastate families, either in their own or with someone close to them, causing them to feel they need a financial safety net. “They want to make sure that they are going to be OK if a separation or a divorce takes place,” Welka said, reports CreditCards.com. Ultimately, having your own secret fund to spend on the things you want is an issue of control. Whether it’s a controlling spouse that doesn’t let you spend money the way you think you should, or you have a control problem that makes it difficult for you to relinquish the reigns, harmony can be achieved through an honest exchange. There are professionals in the counseling arena that specialize in financial situations, helping both spouses to reach a healthy state of financial openness. If you find out your spouse is keeping a hidden bank account from you, try to refrain from going all G.I. Jane on him. There is a way to address conflict in a marriage that opens up the other party to hearing your concerns without getting defensive and shutting you out, as Mommy Underground has previously reported. On the other hand, if you are the one who is hiding a secret account from your spouse, please consider the long-term ramifications. The payoff of having spending power is not worth the damage that can be done on a marriage. Please let us know in the comments section if you have gone through financial infidelity, and how it was handled.